13th Feb 2018. The Lidon Group’s latest business is set to open in June 2018 in Monread, Naas, Co. Kildare. The new site is conveniently located across from Tesco Monread in Naas. The Lidon Group is a group of sister associated companies owned and run by members of the Fitzpatrick Family. Established in 1954 and originally based in Monasterevin, the Lidon Group has expanded and now operates across Leinster with a range of Motor Dealerships, Agricultural Machinery, Forecourt convenience and food and beverage offerings. The Lidon Group currently employs over 350 people in the various associated companies and in 2016, it established a dedicated support office which has specific departments to oversee all Finance, HR, Facilities and Marketing operations for all of the groups individual companies. Junction 14 Mayfield opened in 2011 and is one of Ireland’s busiest service stations. Conveniently located just off the M7, it gives commuters an opportunity to Relax, Recharge and Refuel without adding extra time traveling on to their journey. Junction 14 Mayfield has a range of food offerings and is renowned for it’s first class facilities and won the forecourt of the year award for 3 consecutive years. M3 Services Mulhuddart is a state-of-the-art Service Station located just off the busy N3 in Mulhuddart, Dublin 15. Opening in April 2016 and it has already become a favourite for the local community and businesses in the locality. Winner of the 2016 Overall Service Station of the Year Award. M3 Mulhuddart Services offers a range of cuisine from Chopped, Supermac’s, Insomnia, Moreish café and Mace store. Crossings Toyota Naas was established in 2012 by Liam Fitzpatrick. Conveniently located on the Sallins Road in Naas, Crossings Toyota is Kildare’s only authorised Toyota sales and service dealership and home to Ireland’s best selling car brand for 2016 & 2017. Crossings Toyota also has a full repair workshop along with a servicing & parts department that cater for all makes and models. JH Fitzpatrick LTD is one of Ireland’s oldest agricultural machinery dealerships. Selling a wide range of tractors & farm machinery from the top brands such as Case IH, McHale & Manitou. JH Fitzpatrick is a market leader in machinery on the forefront of current technology. JH Fitzpatrick also has an extensive parts department along with a team of fully trained Service Technicians. Established in 1954 by the Fitzpatrick family, Monasterevin Motors is one of Ireland’s oldest car dealerships. With vast experience in the motor trade from Sales, Servicing, Parts and Body-shop Monasterevin Motors is a one stop shop for all vehicle needs in Kildare. Monasterevin Motors are also approved Toyota parts and service agents and Isuzu parts and service agents. Fitzpatrick’s New Lodge has been in business for over 60 years and consists of a Texaco Petrol Station with top brands such as a Spar store with a full off-license, an Insomnia Café & a busy Deli serving a variety of freshly prepared hot and cold food offerings and homemade breads and cakes. Fitzpatrick’s new lodge is a firm favourite with the locals of Monasterevin and in 2016, won the best small forecourt of the year award. 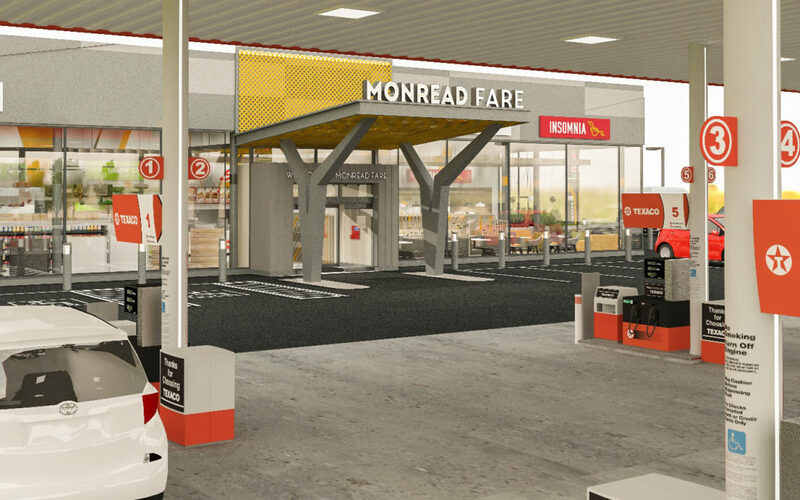 New Naas development Monread Fare, conveniently located across from the Monread shopping Centre, is set to open in Summer 2018 creating over 40 new jobs in the area for both full time and part time staff. This state-of-the-art facility and will have 12 Texaco fuel pumps, seating for 50 people along with a Spar convenience store and deli, Papa John’s Pizza, The Chicken Guys and Insomnia cáfe.